As expected, T-Mobile today launched a special offer to celebrate the launch of the LG V30. 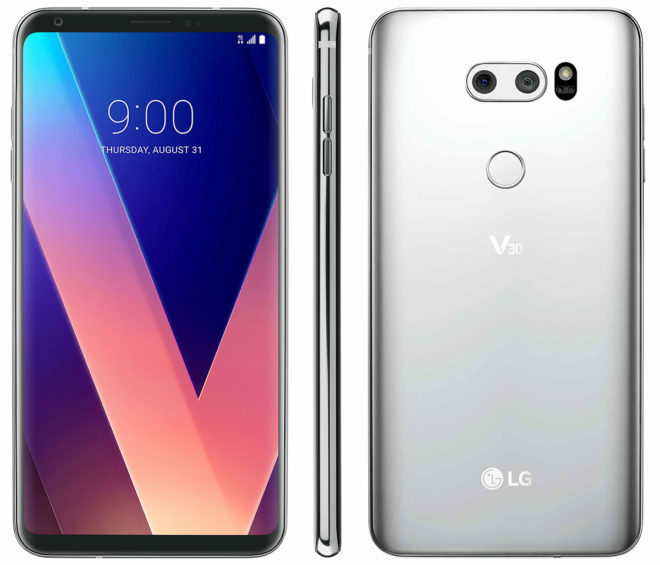 Starting today, October 13th, customers who buy an LG V30 from T-Mobile can get a $500 rebate (prepaid MasterCard) with the purchase of a second LG V30. Both smartphones must be purchased on EIP, and you’ll need to activate at least one new line to be used with one of the devices. The total price of the LG V30 is $800, so this deal would leave you with $300 left to pay for the second V30. Both new and existing customers qualify for this promo. Existing customers will need to be on a T-Mobile One or Simple Choice unlimited plan and add a line to take advantage of the deal. Also of note is that customers that’ve already pre-ordered the LG V30 can get this deal, so long as they meet all of the other requirements. If you don’t want a second LG V30, you can also get a free LG G6 or LG V20 with the purchase of an LG V30, LG G6, or LG V20. The same rules mentioned above apply to this offer. T-Mobile customers that buy an LG V30, LG G6, or LG V20 on EIP can also get an LG G Pad X2 8.0 Plus tablet or LG G Pad X 8.0 tablet for free, via $10 monthly credits over 24 months. You’ll need to buy the tablet on EIP and put it on a T-Mobile One or Simple Choice Mobile Internet plan with 2GB of data or more per month. Finally, LG is giving out a free Google Daydream View VR headset and a bundle of VR games to consumers that buy and LG V30. The LG V30 is now available in stores and online. It’s priced at $80 down and $30 per month for 24 months on EIP or $0 down and $33 per month with JUMP! On Demand. I love how T-Mobile wants everyone to just add a bunch of dummy lines to fluff their subs. I mean, I get it – the wireless industry is at saturation, but this is feeling pretty weak. I’m ready to buy a new phone but haven’t been able to get any new offers because, surprise, I don’t need any more freaking lines. I have 5 now and only 3 ever get used! Agreed, there’s a lot of people that just see a deal as something they need, even if it’s not a deal that’s in their best interest. The extra lines may not be too expensive, but over time you’re just paying for something you don’t even need which is a waste of money. I have 3 free lines and don’t need to buy a phone line I don’t need. So I just have to wait for Black Friday it sounds like. Great point, Black Friday deals on phones will be just as good, if not, better than the current promotion. Backup, Christmas present, I always wanted to try the G6, a camera to take pictures of my new phone, wifi media player…..I can keep going on if you want. “a new phone to use as a camera to take pictures of my new phone” lol – how vain. Just shut up and wait for the price to decrease. Give as a gift or for a spouse/partner/kid or as a backup phone OR sell it. Jump on this deal while you can. Once TMO and Sprint merge (and I hope they don’t), deals like this will be OVER !!! Personally, I’d rather get the unlocked version. So thanks but no thanks, TMO. On the contrary. Confucius says that the larger the behemoth, the better deal$ it will obtain. I’m sorry but you are wrong and so is Confucius. Mergers and acquisitions are NEVER good for the consumers. Considering it requires specific plans or addition of lines, won’t miss them. Talk about adding 0 value to the conversation. Nothing but I was told, my friends had one, etc. In both cases, the V30 had more screen on time that all it’s flagship competitors. Headline from P.A. : LG V30 battery life score is out: big improvements! I haven’t had a normal day of usage with mine but so far but it seems better than my previous G6 as far as battery life. How quickly did they return both of their phones? Within a few hours of use or a day? Did they perhaps have an bad app that was draining the battery? Seems to me that it’s a little premature to get this V30 and immediately return it due to battery performance. Really nice phone for $500 that’ll be in about 3-4 months. Battery life on V30 rivals the S8+! I played around with the camera and I was very unimpressed. I thought this was supposed to be the best camera in a LG smartphone ever? All reviews are saying it is..
As a photographer, I’m very impressed. Of course, I did more than just play with it in a store and I actually know what I’m doing. I have a ton of photography experience and know my stuff when it comes to camera’s so don’t assume that I don’t know what I’m doing. And I stand by my original claim that I was unimpressed with it’s performance. I dunno. I’ve been shooting for more than 30 years, have worked a dozen years in an art museum with a very fine photography collection, and have already turned out several stunning photos with the V30. It’s definitely an impressive little device. Not sure what’s wrong with the one you played with but it definitely takes more than just “playing with it” to know if it is capable or not. I actually had the same impression when I played with it in the store. The dynamic range wasn’t great in Auto mode and the image looked surprisingly washed out. I expected better, but maybe it was the lighting? Something is wrong with the image processing. Hopefully a software update can correct it. Went to the store today. to pick this up and none of the 5 stores i called received their shipment , anyone know why ?? Same thing here. No where to be found. Same North of Seattle. I realize it’s not met with the same fervor as the iPhones or even the Samsung devices, but for no stores to have the phone on launch day without explanation is pretty bad. could be caused by the West Coast fires. That could affect shipping. I would think it has more to do with lowered sales expectations given the difficulty the G6 had. I’m sure as more and more people start complaining, they will ramp up quantity some. Pretty lame to keep the requirements on the BOGO V20 & G6. You’d think they’d want to move old inventory. It will fail on TMo at least. Lets see – announced almost 2 months ago. SUPPOSEDLY released yesterday yet can’t be found in stores – WHY (according to other comments on here and I went into the store earlier today to check it out)?! And it will be supplanted next to other phones with no big ad display. The writings on the wall. I don’t wish it to fail, it’s just the way it is. I would maybe pick it up if TMo wasn’t offering only silver. I’m so bored with silver phones. Yeah Tmobile usually puts this phone along with lg g6 next to the low end phones on the affordable wall. What a shame. Went yesterday and you nailed it. Far back, right corner is for LG stuff. My store did not have V30 on display but did have some for sale. I did not buy it. The real deal will be when the V20 hits sub $300. I don’t blame you,have no idea or who thought it would good idea for Tmobile to only offer the silver,what the phones comes in 5 other colors? Lame on Tmo part,like you wrote 2 months ago they announced this phone,only to offer it in silver?What are you thinking of Tmo? Anyone with the V30 confirm if most YouTube videos are cropped? I’m assuming it has no expand feature like Samsung. Also if I strictly use phone mostly for games and media viewing, should I stay with iPhone 8 plus or Lg v30 or note 8? Thoughts. You have to buy two V30 phones and spend a total of $1,600 (800 each) to get $500 back. To me it sounds like the V30 should really be $550 max. Only if T-Mobile sets prices for LG, which they do not. It wasn’t very smart to drop the V30 between the Note 8 and iPhone 8 and X release. LG should of beat both Samsung and Apple releae dates. Edit: DELETED, I’m not the only one who can’t find it. Was thinking hard about jumping on this,but my question is this,they wait 2 months to come out with this phone,Oreo op is out so why doesn’t this phone have it from the get go? The same thing with The Note 8? I will wait until they start pushing out phones with Oreo,then make my choice. First off, Samsung/lg/huawei/nokia/etc always water down the updates so it is just not a big deal, second, many of the big new features have already been on these phones for forever like 1 touch go back to the last app has been around since like the note 2 so the update does not add as much as one might think. I am more excitied to see what changes samsung and lg makes to their own software bundled with the update than the minor tweaks to android in oreo. Thanks for the headup,still using my Note3,unless I rooted it,it staying on lollipop. Also this has nothing to do with os,how this good or bad this phone is,major comedown Tmo is only selling the silver,which is a bummer for me couple other people on here said the same thing, only silver. So luck would have it my wife dropped and completely destroyed her Moto x pure edition last Friday. Unfortunately the BOGO S8’s just finished so we went for the V30 get a G6 BOGO. I returned my V30 and traded it for the G6. 1) the V30 came with a scratch on the aluminum frame 2) if you’re reading stuff with a white background there’s a seam between the glass and the aluminum frame above the selfie cam where light bleeds through 3) the blue tint at the slightest angle is very annoying. 4) after messing around with my wife’s G6 the camera is just as good, the screen just as bright, the phone feels just as fast, standby time is still great (1% every 4 hours). The only negatives would be the phone gets a little hotter under heavy use, doesn’t have 64 GB of room and battery life when being used is weaker. Besides that I’m very happy with the G6 oh and it was half the price after BOGO rebate. I’m looking to get the LG V20 BOGO. I’m ok with the temporary new line that I cancel after I get the rebate but they say the new line must be on the new V20. How can they enforce that if I can just swap the Sim cards around on the phones?